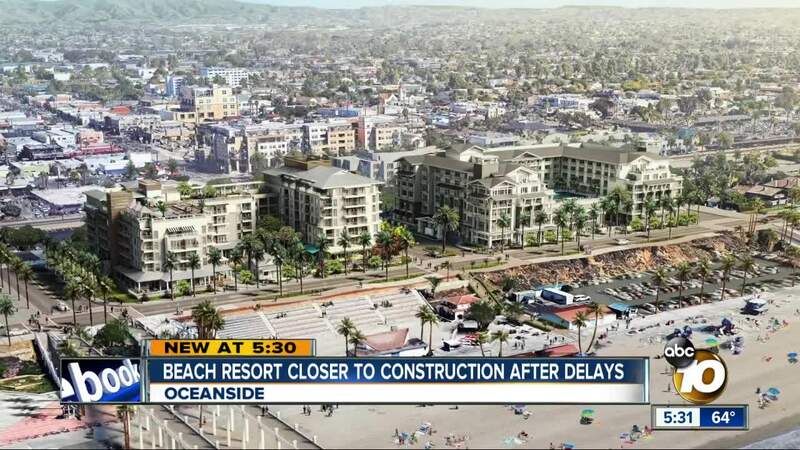 OCEANSIDE (KGTV) — After a decade of delays, the Oceanside Beach Resort is weeks away from construction. The initial approval for the project happened 13 years ago when the City of Oceanside selected the developer. The project is located near the small white beach home featured in the movie Top Gun. 10News talked with Senior Vice President of S.D. Malkin Properties, Jeremy Cohen, who said they ran into many roadblocks along the way. "We faced a lawsuit, we won, it was appealed, and we won that, and that kind of brought us to where we are today," said Cohen. The lawsuit claimed the program the city uses to share hotel taxes and support the development violated the state constitution. Along with a drawn-out lawsuit, they also were pushed back by the Great Recession and a period of delays in redevelopment across California. Cohen tells 10News, “Although it had been done dozens of times in the state before, it was the first time it was challenged. The court found it was completely constitutional, completely acceptable, and so it just delayed us for three years." Construction is now set to start in December 2018, just before the new year. “There will be a couple of months of excavation; then you’ll see a concrete superstructure, about six or seven stories,” Cohen detailed. The parking for the beach resort will be relocated to an underground garage. As far as the Top Gun house is concerned, it will be completely taken off the property. Historians will preserve the exterior and Cohen will update the inside. “We’re looking at it as a really special kind of ice cream place so everyone can come in and get a 'top cone' from the Top Gun house," Cohen said.